Are UMNO leaders turning against their former boss Najib now? UMNO leaders seem to be no more supporting or defending their former boss Najib Razak since the fall of Barisan Nasional (BN) on May 9 General Election. Before the election, when he was in power, all of them were at his side though he was accused of stealing public fund from 1MDB and turning Malaysia to a Kleptocratic society. They even supported him to silence the media and the critics and pose a severe law on social media users. But immediately after BN lost the election, some UMNO members asked Najib to resign as the party president- and he did not defend his presidency . Later on, the former Prime Minister Najib was charged with 45 offences in the court related to money laundering, abuse of power, and corruption linked to 1MDB scandal. His wife Rosmah Mansor and the then deputy prime minister Zahid Hamidi were also charged with several offences related to corruption and abuse of power and bribes. Malaysia new Prime Minister Dr Mahathir stressed from day one he took to power that Najib and his alleged former corrupt officials would be charged in court according to the rule of law. Najib has always denied all accusations. He maintained that the US$700 million (RM2. 6 billion) he received in his personal bank account in 2013 was a donation by the Saudi royal family, and not from 1MDB. He also reiterates that Pakatan Harapan, the rival party, has been just accusing him and lying to the public for political motivation and that BN lost in the general election not because of 1MDB but because of Pakatan Harapan lies and fraud. However, after losing the election, many UMNO members no longer believe him, and some of them left the party. Some of them went and joined the winner party- Parti Bersatu- that was once their enemy. Some Barisan Nasional and UMNO leaders feel like having been cheated by Najib Razak, a local newspaper said today. “This has led to Malaysians, Umno members particularly, feeling cheated as all this while they accepted his explanation that the money was a donation from the Saudi government. “What is more illogical is that Najib had never taken the initiative to show his gratitude to the Saudi government or to King Abdullah directly if the big sum was indeed a donation from them,” Umno mouthpiece Utusan Malaysia today wrote. Utusan added, Najib’s “lies” were finally exposed during his recent interview with Al-Jazeera. The paper said it did not make sense that the former prime minister did not know the original source of the money in the wake of revelations showing it was from Tanore Finance Corporation. “Not all thieves are liars but those who lie are usually thieves,” the paper said. In the Al Jazeera interview aired on Oct 27, Najib said that he had no details of the source of the “donation”. “So when I received the funds, in all honesty, I thought it was a genuine donation and at that particular time, the knowledge that I had was based on a conversation with King Abdullah,” he had said, Free Malaysia Today quoted. In another recent bombshell, the former Barisan Nasional secretary-general Datuk Seri Nazri Aziz and former Umno Youth chief Khairy Jamalluddin both said and agreed that Barisan Nasional’s defeat at the last elections was due to the 1MDB controversy, rather than any of Pakatan’s so-called “lies” as previously claimed by Najib. 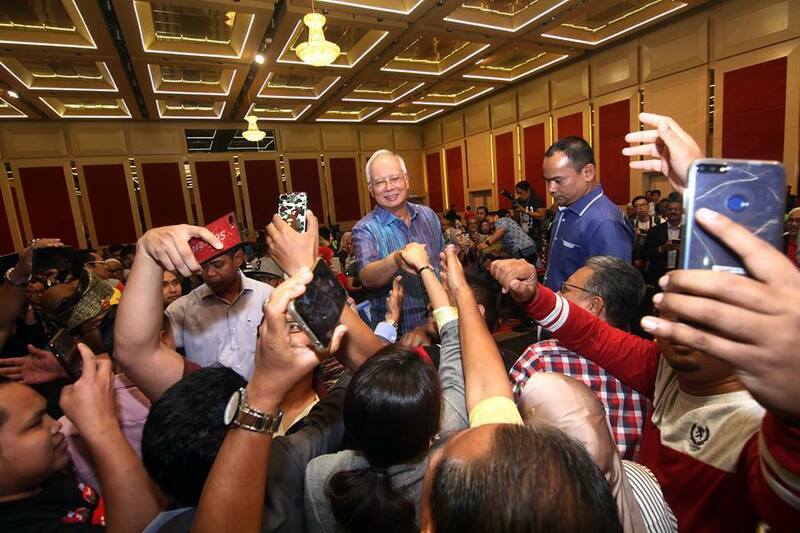 However, the Former Umno president Datuk Seri Najib Tun Razak has hit out today at his critics, saying that their claims are based on their opinions on news reports which are “inaccurate and naughty” (tidak tepat dan nakal). UMNO party is at the edge of vanishing – the party is suffering now a bad state of weakness since it lost the election and particularly that its new president Zahid Hamidi is also accused of several alleged acts of corruption and abuse of power. The Crown Prince of Johor, Tunku. PETALING JAYA: The Sultan of Johor.